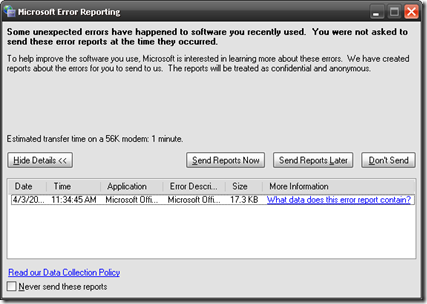 When crashes occur in the Windows XP environment there has always been this aggravating error reporting popup that allows you to decide to send this information to Microsoft. As a good Windows citizen I chose to send reports zealously ... anything to help keep my operating system of choice as stable as possible. After about the 30th time I realized that this was not something that I wanted to do every time. 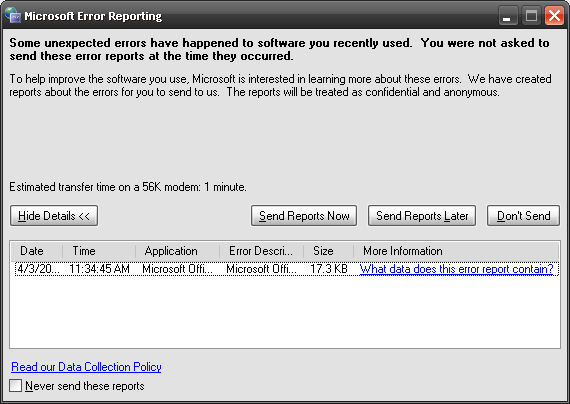 I recently got this updated popup message that informed me that they have been storing my error. Now this should be noted as a marked improvement, because I generally do not want to send reports while I am dealing with a crash of any kind. I was then hopeful that it would contain an option to always send the report and stop asking me every single time ... no luck ... I am just going to opt to Never send these reports and transform my self into an unresponsive citizen of the Windows world.